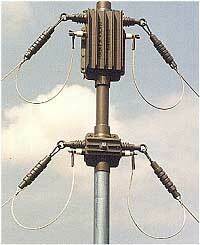 Base station antenna FRA1530KW designed for multi frequency medium and long range communication. Antenna VSWR measurement have been carried out by the Swedish Armed Forces Research (FFV), using: WILTRON 5411A Scalar measurement system. No antenna tuner required. Can be assembled as flat top or inverted "V" with one, two or three mast installation. Heavy duty construction for any climate use. All material stainless steel or similar for long life operation. Recommended antenna height 10 meter or more. Connecting rings for vertical lifting. Connecting rings for horizontal lifting under extreme conditions. Al. tube Dia 50mm for vertical assembly on the mast. Connection points for connecting bar. "N" connector for coaxial cable. Connection for easing of load on coaxial cable. Winding hooks for antenna wire under transport. Nylon belts for locking antenna wire under transport.